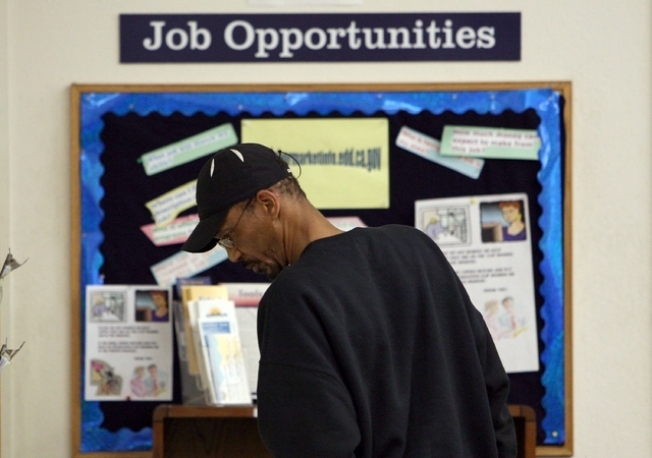 A job seeker looks at job listings posted at the East Bay Works One-Stop Career Center in Oakland, California. OAKLAND, Calif. - In nearly two decades working at the NUMMI auto plant, Lynn Chess has been able to buy a house, fund her children’s college education and even afford luxuries such as a 2008 cruise she took with family and friends. While black workers were as likely as other workers to hold manufacturing jobs between the late 1970s and the early 1990s, by 2007, blacks were about 15 percent less likely to have a job in manufacturing than workers of other races and ethnicities, researchers at the center found. On a broader level, blacks long have faced a much higher unemployment rate than the population as a whole and are now facing a much deeper employment crisis than the entire work force. The unemployment rate for blacks hit 15.7 percent in November, compared with 10.2 percent for the nation as a whole. The long, deep downturn is raising concerns that the recession could cause permanent economic damage to blacks who have reached middle-class status. “The erosion of earnings of African-Americans in this recession is another real consequence that’s hitting the middle class,” said Ronald Mincy, a professor at the Columbia University School of Social Work. Another concern is that such a large-scale loss of middle-class jobs will undo some of the progress made in recent decades combating poverty among blacks. Thanks in large part to improved employment prospects, the poverty rate for blacks generally decreased through the mid-1980s and 1990s, hitting an all-time low of 22.5 percent in 2000. But by 2008, the poverty rate for blacks had risen again to 24.7 percent, compared to 13.2 percent for the population as a whole. In the current recession, experts are particularly concerned about black workers who don’t have advanced training or a college degree and who are losing the type of good jobs, with health care and retirement benefits, that are becoming scarce. Pitts' research also has shown that about 40 percent of black workers are employed in three major industry sectors: Retail, health care and social assistance, and manufacturing. In addition, many experts say that black workers continue to face a tougher time finding employment, and are more likely to be unemployed longer than the nation as a whole. Some black workers who have lost their jobs in this very difficult market say they fear falling into the kind of poverty and financial struggles that disproportionately affect blacks in the United States. When Demanus James, 48, was working as a custodian at the University of California, Berkeley, she often would pass homeless people on her way to and from work and occasionally would help them out with things like bus fare or clothing. Now that her job has been eliminated, she worries she could become one of them. “That’s my biggest fear, because I’m not going to be able to hang out on the street, homeless,” she said. James, whose mother and grandmother also worked as custodians at the university, and whose brother still works there, said the job paid enough for her to rent an apartment in a nice neighborhood and occasionally splurge on little treats, such as getting her nails done with her granddaughter. It also offered health and retirement benefits. At her age, she thinks it will be tough to find any job, let alone one that offers the same level of pay and benefits. James also worries about the effect her job loss might have on her 11-year-old granddaughter, for whom she wants to be a positive role model. “If you get a working family, your kids will work,” James said. Bobby Jones, 44, shares James' fears. As soon as he found out he'd be losing his job as a janitor at UC Berkeley, Jones said he immediately put together a resume. After about two months he'd had two job interviews. He’s also working on starting his own business. Despite the economy, Jones said milestones such as having a black president have given him hope. “Just having a person of color in office should inspire people like myself,” he said. Some worry that this recession will spell the end of their middle-class dreams. Chess, the NUMMI plant worker, came to California from Louisiana as a child when her father got a job at the carmaking plant, which was then owned by General Motors. Although her father did not even get his high school equivalency degree until he was in his 70s, his career in the auto industry afforded the family a middle-class life and paved the way for Chess and others in her family to get similar jobs. Chess started working at the plant in 1975. When GM shut its operations there in the mid-1980s, she moved to Oregon and worked as a bank teller. Chess returned in 1991 to work at the plant, which by then had reopened as NUMMI, a joint venture between General Motors and Toyota. Chess and her co-workers already have had their hours cut because of the downturn in auto sales, and in part because of that she recently made the difficult decision to allow her house in Antioch, Calif., to fall into foreclosure. The housing woes many are facing on top of their employment concerns have led her and her family to joke darkly that if they cannot find new jobs, they’ll all be reduced to sharing the same cardboard box. Although she has seen some jobs in her field as a training coordinator, most require a college degree that she doesn’t have. And at age 53, Chess worries that employers will favor younger workers over her extensive experience. She hopes that racial bias won’t play a role in her job prospects. “It’s hard to tell, would it be race or age? Either one I’m still scared,” she said. Chess also fears the effect the plant closing might have on her daughter, who worked summers at the plant while she was in college and recently endured a difficult job search of her own. Although Chess’ daughter did eventually find work, it was not in the field she studied in college.